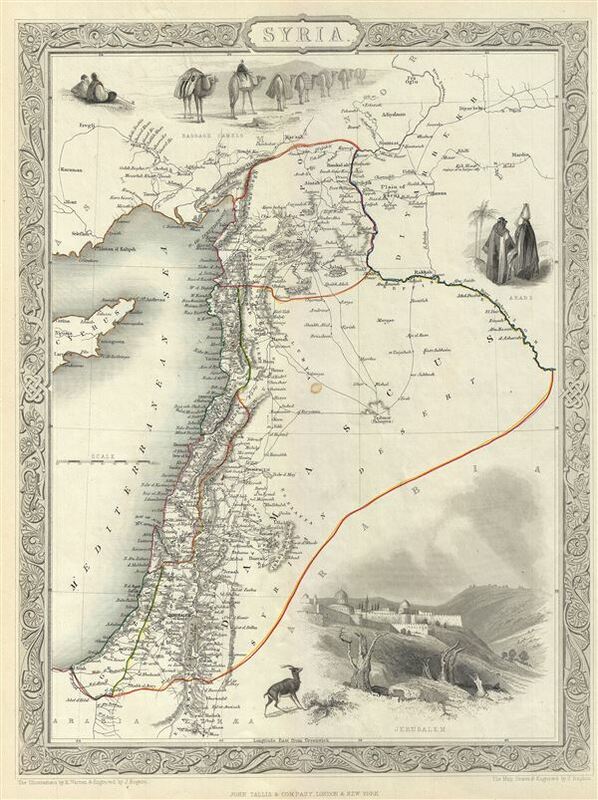 This is an appealing example of John Tallis and John Rapkin's 1851 map of Syria. It covers from the Gulf of Iskenderun to the Dead Sea and includes the modern day Syria, Lebanon, Israel and parts of Jordan and Turkey. The map includes beautiful illustrations by H. Warren of baggage camels, Jerusalem and Arabs. This time in history marks the decline of the Ottoman Empire, which Syria was part of, but largely ignored by world affairs. The whole has the highly decorative presentation and elaborate border distinctive of Tallis maps. This map was issued as part of the 1851 edition of John Tallis and Company's The Illustrated Atlas, And Modern History of the World. Very good. Blank on verso. Minor dampstain near center of map. Rumsey 0466.040. Phillips (Atlases) 804.